My latest book project is an end-user SharePoint 2013 book called How to Do Everything: Microsoft SharePoint 2013. this is, of course, a new edition of my last book, How to Do Everything: Microsoft SharePoint 2010. As with the 2010 version, my good friend, Arpan Shah, Microsoft Senior Director of Office 365, has contributed a section on the history of SharePoint and also written the foreword. What I set out to do in the first edition was focus on the most important cases for the day-to-day user. I trust readers are conscious of the fact that the “How to Do Everything” series name doesn’t mean that all of SharePoint can be summed up in one book. This book is squarely focused at the end-user. For the second edition, I don’t want to stray too far from my original goal. However, I’ve listened to all the feedback from the first book. Readers wanted an end-user book, but some wanted it to take them a bit further, so that’s what I’m going to do. I’m adding content about SharePoint administration and other topics that aren’t necessarily required for every user, but will be interesting to those who want a bit more. I’ve worked with McGraw-Hill Osborne Media on other projects and they’re a great publisher to work with—professional and helpful. "Written by a former member of the SharePoint development team, this is a step-by-step guide to mastering the latest release of this integrated suite of server capabilities.In How to Do Everything: Microsoft SharePoint 2010, Stephen Cawood—one of the people who helped build SharePoint—offers advice from his many years of working with SharePoint customers, cutting to the core and focusing on key features to get you up to speed quickly. You’ll get easy-to-follow tutorials on blogs, wikis, My Sites, Web parts, taxonomy, document management, workflow, publishing sites, team sites, and much more. 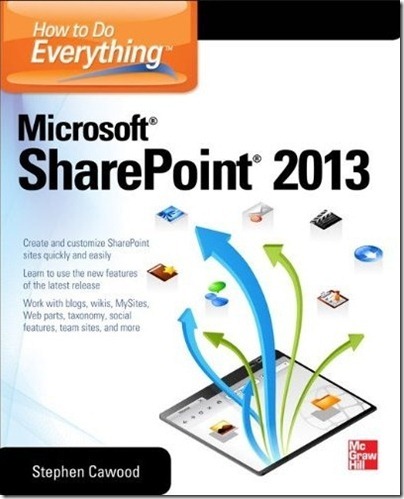 Take full advantage of the content management, enterprise search, collaboration, and information-sharing capabilities of SharePoint 2010 with help from this practical guide." SharePoint Server 2013 has been optimized for the way people work, providing people with a familiar, consistent view of information, collaboration. I am wondering if there is a preview of the table of contents that I can look at? I am very interested in this book but am looking for it to include a chapter or two on integration with Project 2013 and Project Web Access via either Project Server 2013 or Project Online. Hi Jax, this book isn't focused on project management with SharePoint. It's meant for end-users who need an introduction to SharePoint. It sounds like you want something similar to the book Raymond Dux Sy wrote about project management and SharePoint 2010. I'm not sure if he's writing a new version of that one. Thank you, Stephen. I appreciate the referral. Good luck with your book launch! Hi, i just bought your book. I am trying to add a calendar onto a public sharepoint site that i built but could not figure out from the book. Would you recommend a solution? Hi Mai. Can you give me some more details please? Which site template did you use? What happens when you try to add the calendar app? Is it just not available, or does adding it fail? Adding it should be as simple as going to 'all site content' and choosing 'add app' then choosing calendar.